A two and one quarter mile raised boardwalk takes visitors through several distinct habitats found within the 11,000 acre Corkscrew Swamp Sanctuary, including the largest remaining virgin bald cypress forest in North America. This natural system is managed by the National Audubon Society to maintain the native plants and animals found here and to preserve the natural process that has been occurring here for thousands of years. The aerial photo below shows a view of the boardwalk area. The boardwalk begins in the Pine Flatwoods area at the Blair Audubon Center. A little bit futher along, a spur leads to the site of an old "Plume Hunters Camp" that is also in the flatwoods. Oak and hardwood hammocks dot the area. Long ago, most of Florida was open pine forest and these were created and kept open by periodic natural fires, so the planys growing here need to be able to recover quickly after the burns. Although at higher elevation than the wetlands, the general lack of topography gives an advantage to plants that can also withstand occasional flooding. Southern Slash Pine, Cabbage Palms and Saw Palmetto dominate the area and, a host of wildflowers are in bloom throughout the year. 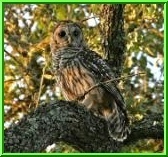 The wildlife in the pine flatwoods varies with the seasons. When the palmetto berries begin to ripen in the fall, raccoons, and the occasional black bears are drawn to the abundant food supplies. Cardnials, woodpeckers, vireos, mockingbirds and red-shouldered hawks are seen a heard throughout the year and are joined seasonally by migrating warblers, towhees and buntings. Wood Storks and swallow-tailed kites soar overhead during their spring and early summer nesting seasons. The Boardwalk trail continues across and along the Wet Prairie. It is a type of marsh dominated by grasses, sedges and rushes, with sand cordgrass being the most common. The time it is flooded during the year is short compared to other wetland habitats. It is slightly lower in elevation than the pine flatwoods, and a combination of nutrient poor soils, fire and flooding help keep this grass-dominated prairie from becoming a pine flatwood or a cypress swamp. During the spring dry-down, herons, egrets and ibis forage in the grasses while hawks hunt the edge of the pond cypress. Wood Storks soar overhead and the occasional sand-hill crane move into the pine flatwoods. As the summer rains begin, deer move into the prairie to feed on the fresh growth and the calls of the frogs are everywhere. The swallow-tailed kites are skimming the tops of the pine trees searching for food. During the fall when water levels are at their highest, alligators move throughout the grasses and a variety of mammals cross the prairie, frequently using the boardwalks to reach the ripening berries and figs in the cypress forests. Pond Cypress is a natural buffer between the bald cypress forest and the wet prairie and pine flatwood. It serves as a an ecotone (an area where two different habitats meet), creating an evvironment where wildlife from both the wet prairie and the bald cypress forest mingle. Pond Cypress are smaller than the bald cypress that are more commonly found deeper in the swamp. Although stunted by the nutrient poor soils on the edge of the prairie, these pond cypress trees are well over 100 years old. Scientists are not in total agreement whether pond cypress and bald cypress are two distinct species. DNA testing suggests they are, but they are known to hybridize. Superficially, the pond cypress has a slightly different appearance, the bark is more deeply ridged, the needles spiral around the stems, and they grow in much closer proximity to each other. Understory plants include sawgrass, ferns, air plants, wax myrtle, strangler fig and a viriety of floweing plants ranging from water lilies and pickerel weed to wild iris and the bladderworts. Standing like sentinels guarding a fortress, bald cypress trees dominate the swamps of South Florida. The old growth bald cypress trees at the Corkscrew are 600 years old and reach heights of 130 feet and more. They comprise the largest remaining virgin bald cypress forest in North America. Swamps develop over time under just the right conditions. As organic (peat) soils accumulate, cypress trees begin to have an advantage over other wetland plants. Because the peat may only be several feet deep, mature cypress trees rely on an extensive system of horizontal roots; cypress "Knees" grow up from the roots to provide the extra stability necessary to have weathered hundreds of years of storms and hurricanes. Natural cavities in the old growth trees provide homes for barred owls, screech owls, wood ducks, raccoons, and other cavity nesters, while pileated, red-bellied, and downey woodpeckers excavate their own holes. Because the cypress trees lose their needles for several months during the winter, light filters down to the forest floor enabling a rich diversity of understory plants to thrive. Epiphytic orchids and bromeliads grow on the pond apple trees, ferns colonize fallen trees and establish themselves on the cypress knees, and red maples take advantage of breaks in the canopy. Less than a half a mile into the cypress swamp, a boardwalk spur gradually rises to an elevated observation tower overlooking the central marsh, which is encircled by the old-growth cypress forest. In South Florida, the sawgrass marshes dominate. The soil is organic, built up over hundreds of years from dead plant material... peat. The typical marsh plants are sawgrass, pickrel weed, cattails and bullrush, although the coastal plain willow is colonizing the area. The periodic fires helps to restore the regular marsh vegetation. During the spring, wood stork nesting colonies can be spotted with binoculars and spotting scopes in the tops of the cypress trees on the north and west edges of the marsh. Swallowtailed kites, vultures, anhingas and storks catch the thermals to soar high above the marsh while vireos, cardnials, and black birds search for food among the plants. Raccoons hunt along the ground while alligators and otters are in the water areas. Queen butterflies use the twining White Vine as a nectar source and larval plant, while Viceroy butterflies prefer the willow. The Lettuce Lakes area along the boardwalk trail are in the bald cypress forest, but when water levels are too deep, no trees can grow. These deep, treeless channels within a swamp are called slougs. The deeper water and open skies attract a variety of wildlife, especially during the spring when shallower ponds elsewhere begin to dry up. Although they are lakes, the water surface is often covered with a mat of floating vegetation, primarily watter lettuce and frog's bit, which provides shelter for crustaceans, fish, small reptiles, amphibians and insects. 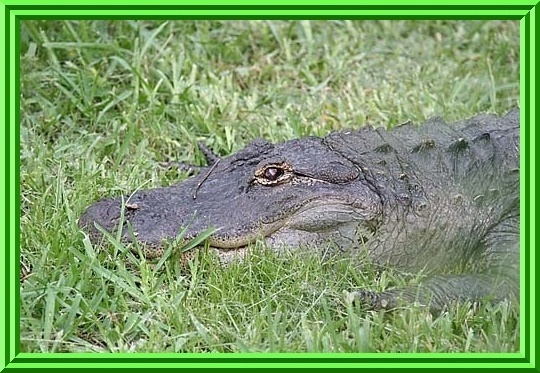 These in turn are prey for the larger animals, notably alligators and wading birds. The floating plants are themselves food for turtles and a variety of insects. Open benches and benches under rain shelters allow visitors to rest and enjoy the show. The boardwalk begins and ends at the Blair Audubon Center, which since its opening has served as the model for other National Audubon Society Centers in the United States. In addition to serving as the entrance to the Sanctuary and boardwalk, it houses the Swamp Senses Media Theater, a tearoom with a food service counter, two fully equiped classrooms, a foyer with paintings, sculptures and photography by local regional artists, and the Nature Store. The store has field guides, books, optics to rent or purchase, and tons of photographs. During the late fall, winter and spring, bird feeders placed at the start of the boardwalk attract thousands of birds such as buntings, cardnals, woodpeckers, chipping sparrows and towhees. Native plants in the adjoining butterfly garden and around the Living Machine, draw hummingbirds and butterflies throughout the year. The Ghost Orchid is an endangered species. It is ilegal under both State and Federal Laws to remove or relocate. The Ghost Orchid is native to Southwest Florida and Cuba. In Florida, its range is very localized in swamps in the Fakahatchee Strand, Big Cypress Swamp and the Corkscrew Swamp areas of Collier and Hendry Counties. This Ghost Orchid is growing on the trunk of a 400 to 500 year old Bald Cypress tree. The previousley higest known location of any Ghost Orchid in Collier County was in the Fakahatchee Strand at 23 feet. This plant is approximately 45-50 feet above the ground. Typically, one to two blooms appear, although there may be as many as ten, and occasionally a plant will bloom twice in the same season. This orchid bloomed three times between July 7 and October 15. The first time, it had twelve blooms at the same time, and the third time it had three blooms at the same time. A Ghost Orchid has not been observed from the Corkscrew boardwalk for at least fifteen years. between thirty to thirty five years old. Habitat: Ghost Orchids are found on trees in hardwood hammocks, slougs and cypress domes. Host trees include pop ash (most common), pond apple (second most common), bald cypress, maple and oak. Epiphytic on other plants and leafless... the photosynthesis occurs through the roots. The roots are grey-green and typically about 20 inches long. Seeds are dispersed by the wind and must land on rough-bark trees. Germination does not occur unless a particular fungi is present where the seeds land. Blooms appear May through August, rarely in other months and the heaviest blooming occurs in July. Typically, there are one or two blooms per plant but, there can be as many as ten. The flowers are white to creamy green colored and usually 4-1/2 to 5 inches in size. 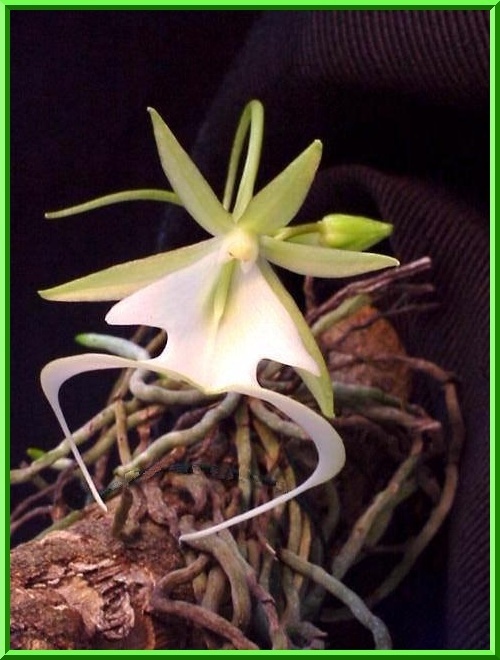 Ghost Orchids are infrequent bloomers with flowers not appearing for years between seasons when they do not bloom. Flowers open in succession, usually one to two at a time and the individual blooms last ten to fourteen days. The orchid is nocturnally fragrant and the lower lip produces two long petals that twist slightly down-ward, resembling the black legs of a jumping frog, the common name, "Frog Orchid." Ghost Orchids are not self-pollinating. 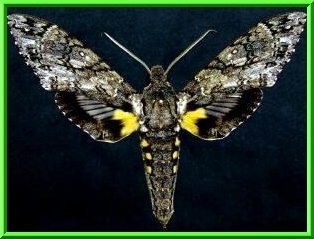 Pollination is done by the Giant Sphinx Moth, the only local insect with a long enough proboscis (4 to 5 inches). The Ghost Orchid received its name because the plant has no leaves (only roots), and when it blooms, the flower appears to be floating in mid air. The epithet lindenii is the scientific name and its derived from its discoverer, the Belgian plant-collector Jean Jules Linden who saw this orchid for the first time in Cuba in 1844. It was the subject of Susan Orlean's novel "The Orchid Thief" but she has never seen one in bloom. Commercial propagation of Ghost Orchids illegally removed from the wild rarely survive. When grown commercially, they must be propagated from seed, a process that takes seven plus years. 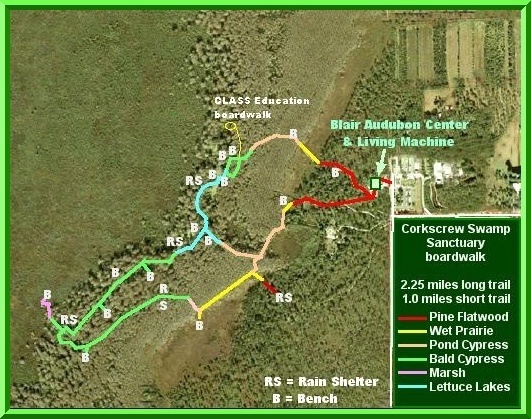 Corkscrew Swamp Sanctuary is located northeast of Naples, Florida in Collier County. It is at the end of Sanctuary Road West, north of Immokalee Road. assist in finding the Sanctuary.